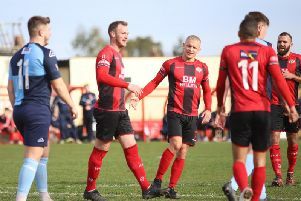 They saw off their nearest rivals in an entertaining clash at Latimer Park that finished 4-2 in the home side’s favour. It is a result that puts them three points clear at the top with two games in hand. It is a position any side would want but is also one that comes with different expectations and needs – as boss Marcus Law explained. “For us it flips the pressure,” he said. “We’ve got to make sure there is no complacency. We have to keep our focus. “There could well be some man-management games to keep people on their toes. “I made two changes on Saturday and we got the result. I made two changes on Tuesday and we got the result. That need to not take any game lightly could not be any clearer than this Saturday’s clash with Rushall Olympic. They sit in mid-table having won five, drawn five and lost five so far this season. It is difficult for the Poppies to know what to expect – something that will not be a problem for their opponents. Law continued: “The Rushall management have previously played for me. “They have sat in my dressing-room for four years so they know how I go about things. “They also have a few players that have worked with me so they will have a better understanding of what we do than most teams. “We have to be prepared to take on an intelligent animal. That was certainly how they approached the Stourbridge success. It was an excellent win – and one Law felt needed that extra little bit of quality up front to decide it. He added: “It was a game between two very good teams. “Given the small margins it was one that could have gone either way. “But we’ve got four or five match winners within the team and our sharpness up front made the difference. “It was Dan Holman that made the difference on Saturday and on Tuesday it was Lindon Meikle with a 30-yard strike and a very tidy finish from Michael Richens that turned it our way. “Then right at the end we’ve got Marcus Kelly with great technical ability who stays cool and calm and seals it for us. “Again it was another tight-fought match. But we’ve been pretty good at those all season.